Por Camaron - Tribute album. 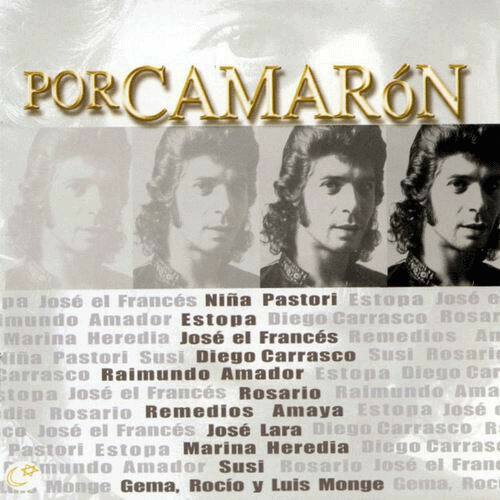 Commemorating the tenth anniversary of his death and under the title 'Por Camarón', the following artists participate in a tribute album to Camarón: Estopa, Niña Pastori, Rosario, Remedios Amaya, José el Francés, La Susi, Raimundo Amador, Diego Carrasco, Marina Heredia, José Lara, Kepa Junkera and Chonchi Heredia. His children Gema, Rocío and Luis Monge joined these artists accompanied by Raimundo Amador's guitars in the song 'Camarón,' a piece originally by Pata Negra. In addition, Diego Carrasco composed 'José Monge Cruz' specifically for this album. Nine songs which were orginally sung by this San Fernando genious and an unedited track composed by Diego Carrasco give shape to this tribute to José Monge, "Camarón," on the tenth anniversary of his death. The disc includes a 15 minute special of a performance in Paris and unedited statements by the cantaor; an interview and cantes from the "París Camarón 87/88" documentary by Miguel Vallecillo. All images of the artists who collaborated for this album by Pasión Digital, except for Raimundo Amador, Nina Pastori, Diego Carrasco and José El Francés donated by Ricardo Pachón and taken by Manuel Cardenas.